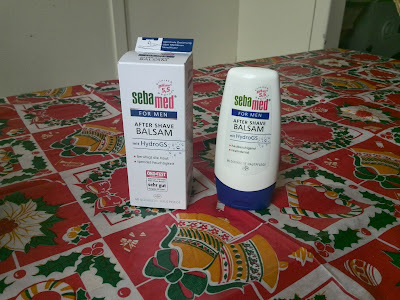 From the brand Sebamed you have probably not heard much about right? At least not when it comes to shaving products? Because I did an search online on Google and honestly couldn't find anything and only found a topic on B&B listing German aftershaves and post shave balms. And neither do I know a lot about this brand. But because the name contains ''med'', I assume that it is a medical brand which is usually aimed at people with very sensitive skin and who find normal care products don't work good and often cause allergic reactions. The Sebamed For Men After Shave Balm comes in fairly striking white cardboard box with some terms on it like ''ph 5.5'' and ''HydroGS'', but also shows off the score in Ökotest which is ''Very good'' - the highest score a product can get with this German consumer magazine. The balm comes in a plastic bottle containing a closure membrane which should provide an optimal dosing according to the manufacturer. I have tried this aftershave balm yesterday and I was initially worried that the dosage system wouldn't work good, because I had this experience with another aftershave balm called Balea Men, which uses also such dosing system and dosed too much, but luckily that's not the case here. The membrane closure doses indeed quite optimal and doesn't dose too much or too less, and is easy to spread out on the face and fast absorbed by the skin. To be honest, I could say this aftershave balm just does what a aftershave balm should do. The scent I would describe as a medical neutral scent. I got this aftershave balm as a present from my lovely girlfriend so I honestly don't know how much she paid, but the score from Ökotest says € 6,99 and compared to other aftershave balms in Germany its quite expensive, but still very affordable. And to be honest this aftershave balm doesn't work so much better than the cheaper ones like Isana Men and Nivea Men, and for this price I would have liked to see it in a more luxury packing, like a glass bottle. But if you got a very sensitive skin then this aftershave balm would be worth trying and I'm happy that I got it as a present from my girlfriend.